Nothing makes a great first impression of your home like a beautiful and striking front door. 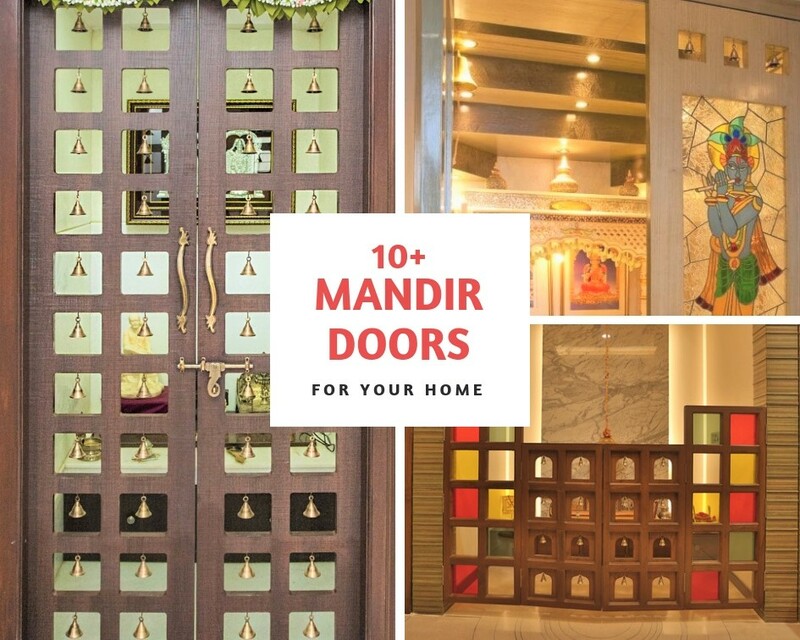 And so, our curation of the 15 best Indian main door designs will help you create the best entrance. Let’s get to them right away (and don’t forget to pin these pin-worthy images)! 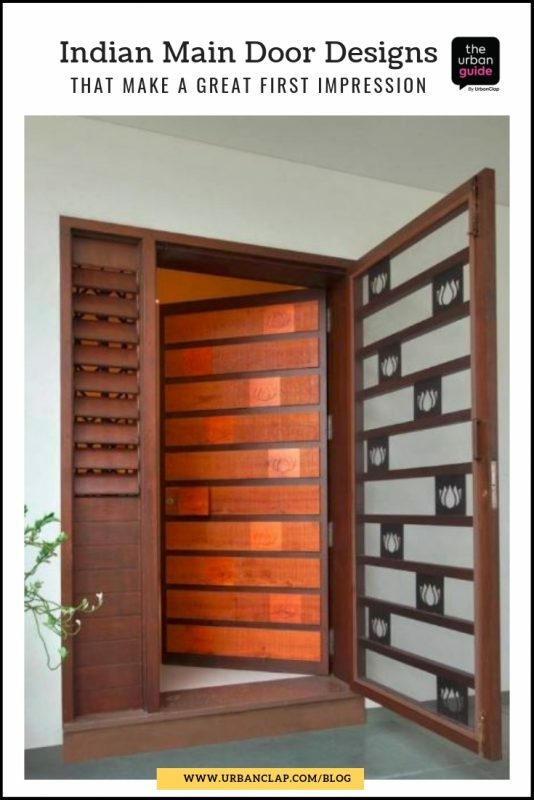 To be honest, this is my favourite of all the Indian main door designs I’ve seen! 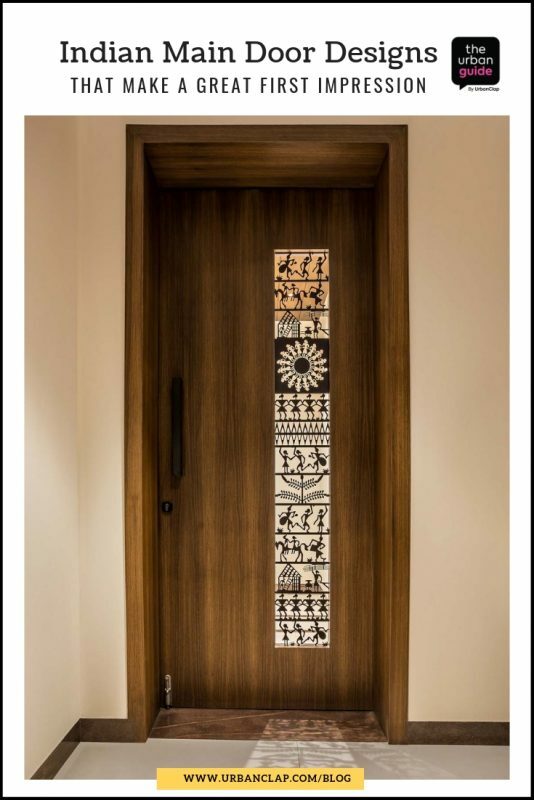 What’s beautiful is how a simple and straightforward wooden door has been given a personality uplift with this eye-catching Warli-themed metal grill work. 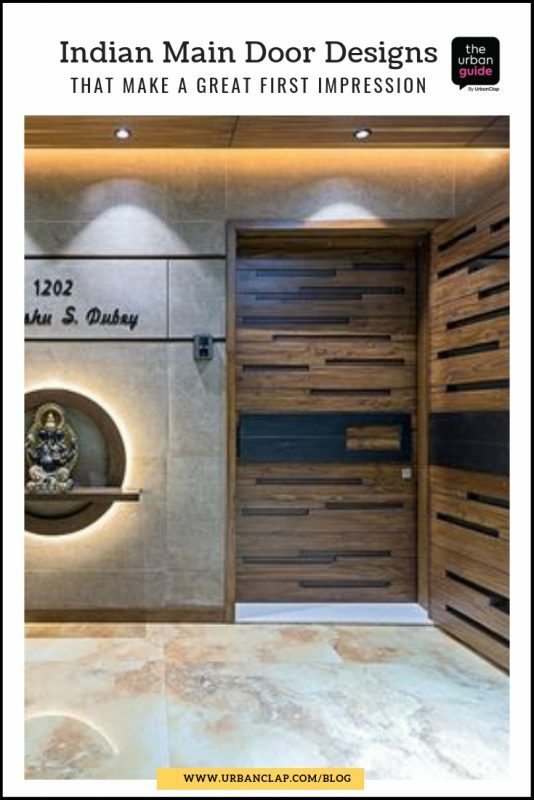 This is a great front door design for Indian homes that want to strike a balance between modern and traditional styles. 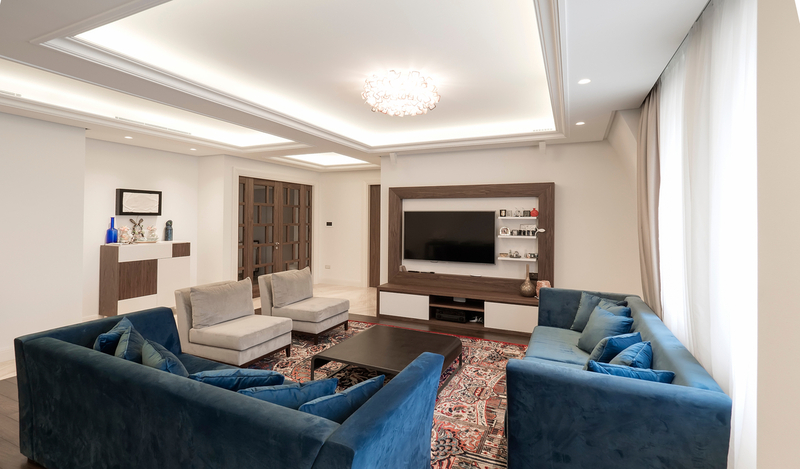 As you can see, most doors that have work wherein you can see through and through the door, are usually accompanied by a second safety door, which is straightforward in its design. The most common doors out there are flush doors (with a flat surface) and panel doors (with the door divided into panels or mouldings). Yet, these simple styles can create a lasting impression too if you just play around with the panels. For instance, in this Indian main door design, the top four panels have been given a striped appearance. You can check with your contractor or carpenter on what all designs he has up his sleeves or you can check Pinterest for designs and get the one you like replicated. The door here is further accentuated with a very rustic and traditional-looking blue console. The flat name and number design in Devnagiri script for a unique yet impressive appearance. Sometimes, all it takes to make a first impression is a unique door handle! 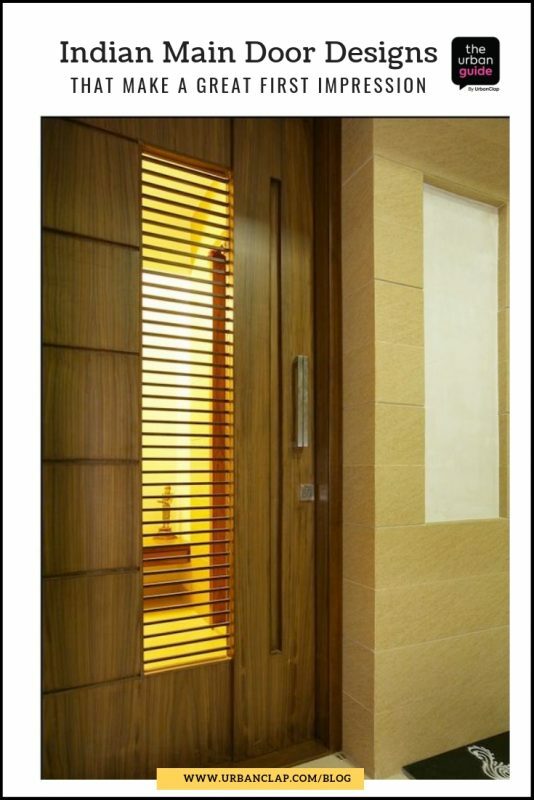 This simple door design for Indian homes, for example, gets a classy makeover with a very extraordinary handle. It’s a great conversation starter and is bound to make your guests ask you where you sourced it from! What catches your eye in this design? Mine heads to the wooden back panel that extends right up to the ceiling with that gorgeous carving on top and a lovely lamp hanging from it. Want to add to the elegance? Pick a distinctive handle like the one in this design and complement it with similar but minimal ornaments on the door. 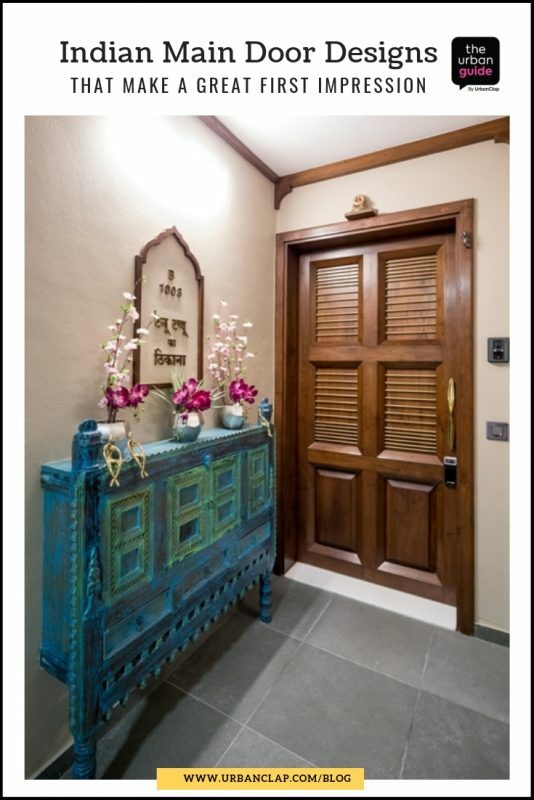 So, door handle + back panel + lamp + carving = a gorgeous Indian main door design. 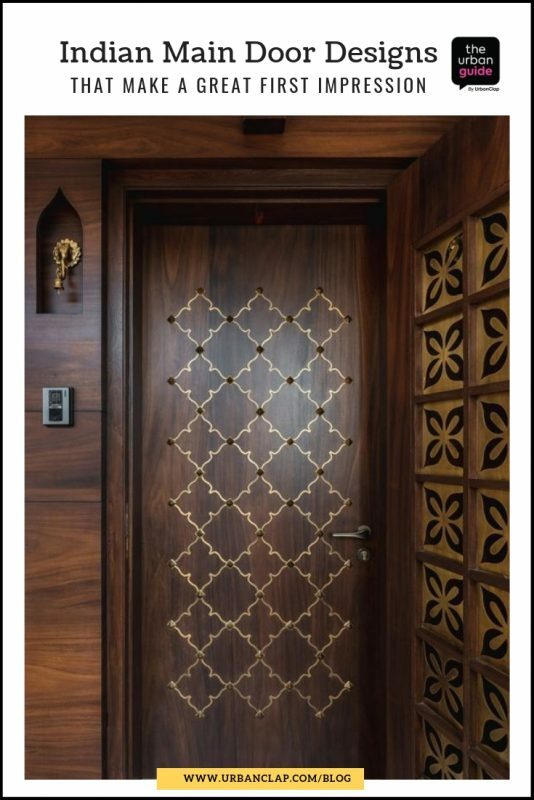 This beautiful door is embellished with traditional motifs created out of what seems like gold leafs. It’s elegant, understated yet stunning. What I also love is how the door is flanked by a floral panel design on one side, and with a niche and a brass bell on the other. This just goes on to show that a main door design isn’t just about the front door but also about beautifying it with other elements like bells, frames, panels, show pieces etc. 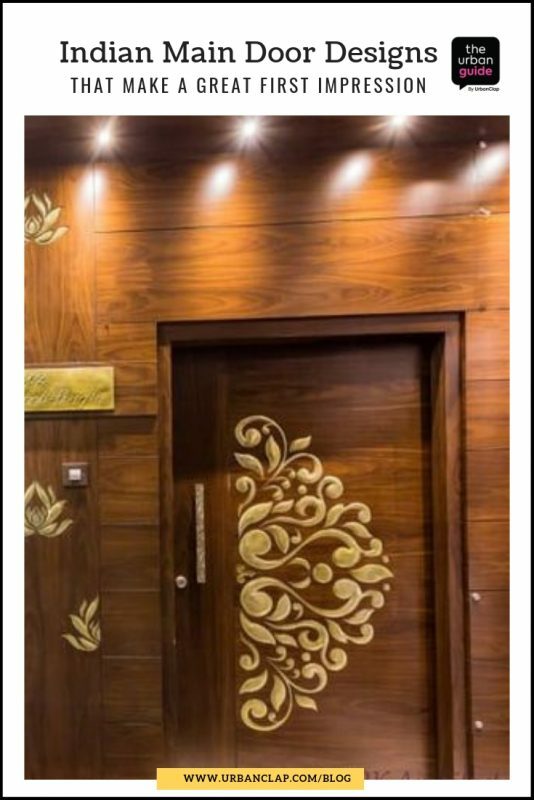 As you can see, gold leaf can be used as a decorative highlight to dress up any piece of wood, even your main door. It’s up to you really how subtle or statement-making you want the design to be. Most door contractors have these designs in their catalogues and all you’ve got to do is pick the one you like. Want to go in for metal? Here’s an example of impressing with steel. 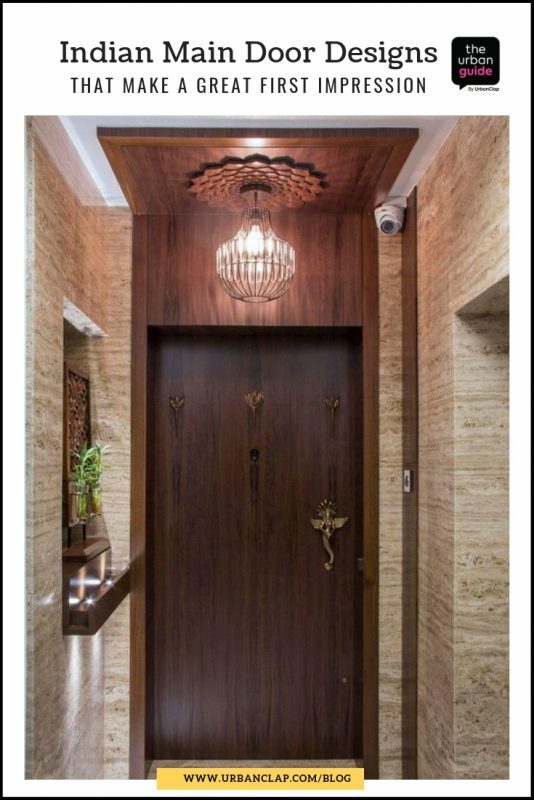 When framed with wood, the imposing door stands out and is striking. Plus, the lush plant decoration on one side complements the door beautifully — so much so that the entire entrance looks gorgeous. For a change, I’ve got a white front door for you! But how does it make a great first impression? By incorporating frosted glass with an elegant floral carving in one of the panels. Not just that! A traditional bell and a lovely foliage that frames the door — all come together to create a stunning front door design. 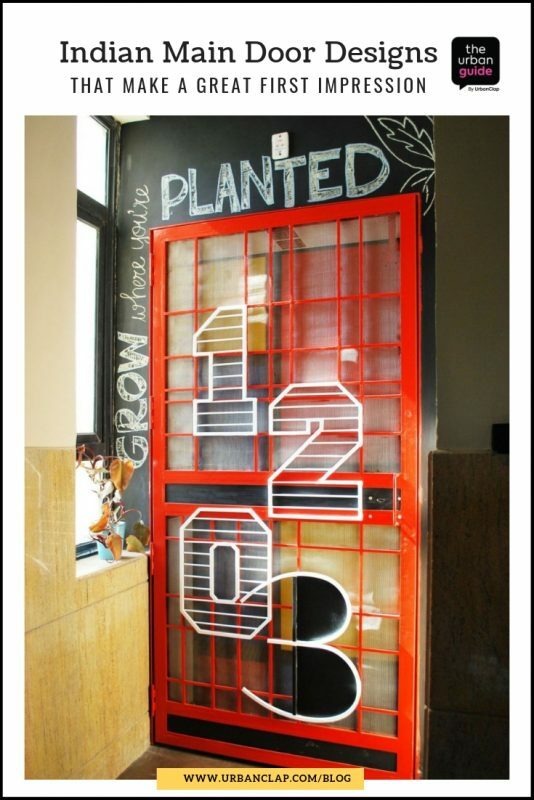 All designs aside, nothing makes a statement first impression like this red metal door! Setting the tone for what lies inside, the bold-coloured metal door is unique, has the house number fixed on it in grill and is framed by a black chalkboard-painted wall with personalised messages on it. Perfect for people with a quirky, cool side to them! The best way to give any regular door design a dramatic makeover is by pairing it with a designer sidelight. Seen mostly in homes abroad, these are side panels that flank the main door. 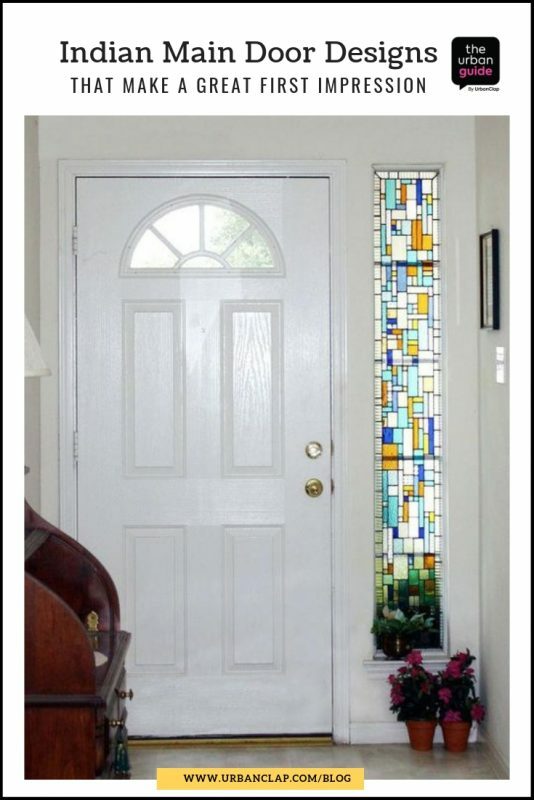 By going for a stained glass sidelight, you assure yourself of privacy as well as a very Indian and gorgeous main door design. 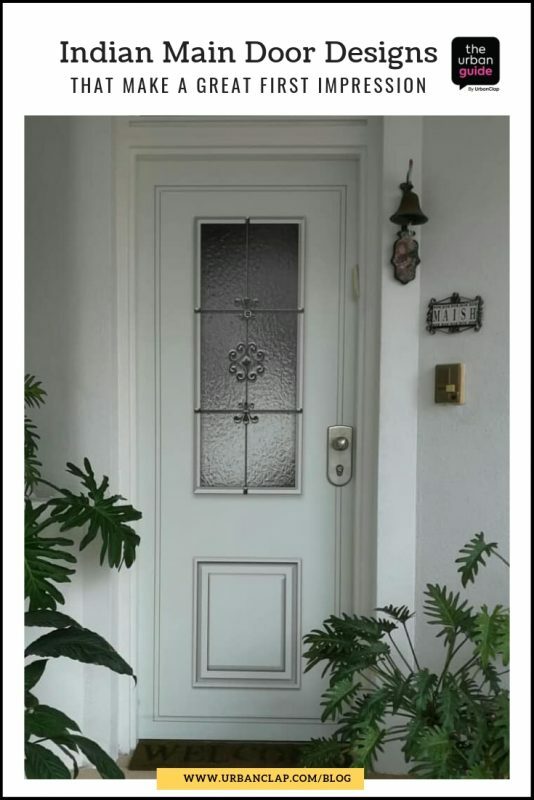 Give your home a sturdy yet attractive entrance with a house door design like this. 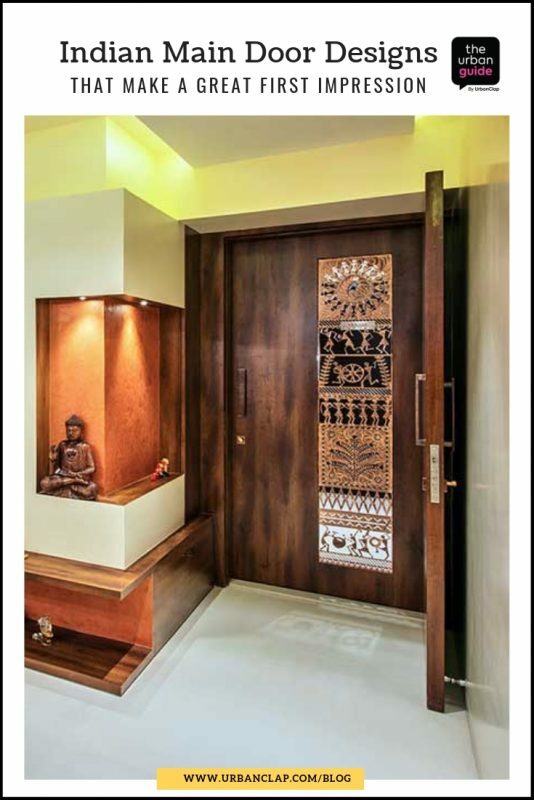 While the back door is a solid, paneled piece that offers security, the front door serves ornamental purpose — it has horizontal wooden bars and metal inserts with lotus-shaped carvings. A wooden side panel with fixed shutters on the upper half completes this look. 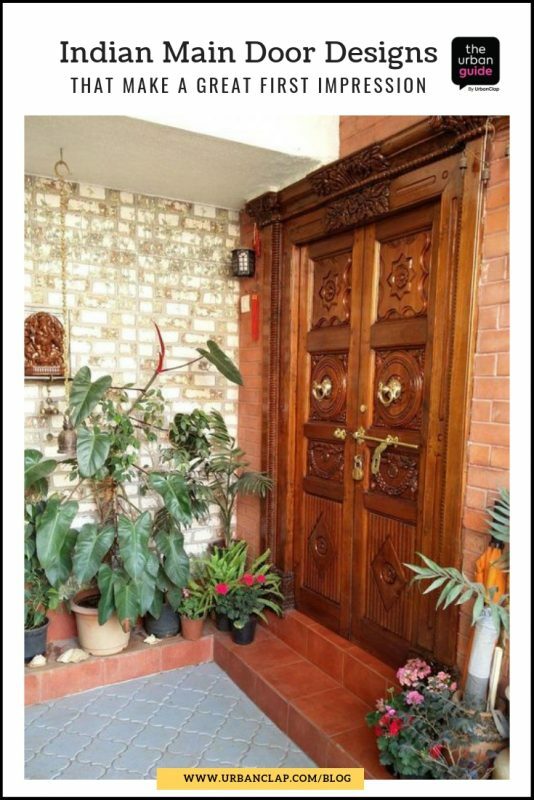 Inspired by the heavy wood and detailed woodwork of South India, this south Indian style main door design looks amazing adorning the entrances of independent homes and villas. Where do you get these beautiful and intricately carved doors? Source them from the craftsmen themselves — cities like Chennai, Hyderabad, Bengaluru and Kochi are full of stores that sell these. Once you get them, just have your carpenter install them for an antique look. Modern Indian apartments these days have been fusing the beauty of grill and wood. A solid wooden front door, with minimal detailing, is given a narrow frame of grill work for some punch. Since it’s the outside front door, accompanied by an inner safety door, it doesn’t require a peep hole! The grill frame works just fine! Look how amazingly stone and wood come together! 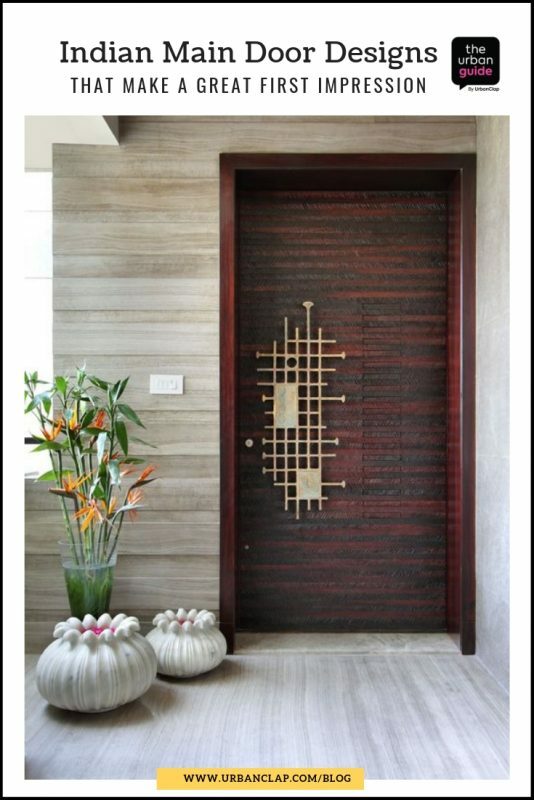 This designer wooden door has been framed by a large stone-clad wall and flooring with a marble effect to create a grand and imposing entrance. 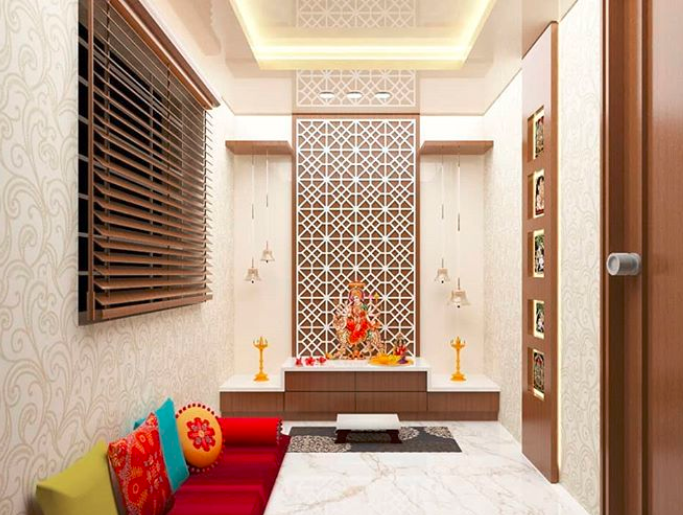 Simple slits and channels in the door give it its unique appearance, while the designer work with the flat number, name of the resident and the statue add tons of oomph. Consider this if you have the budget! 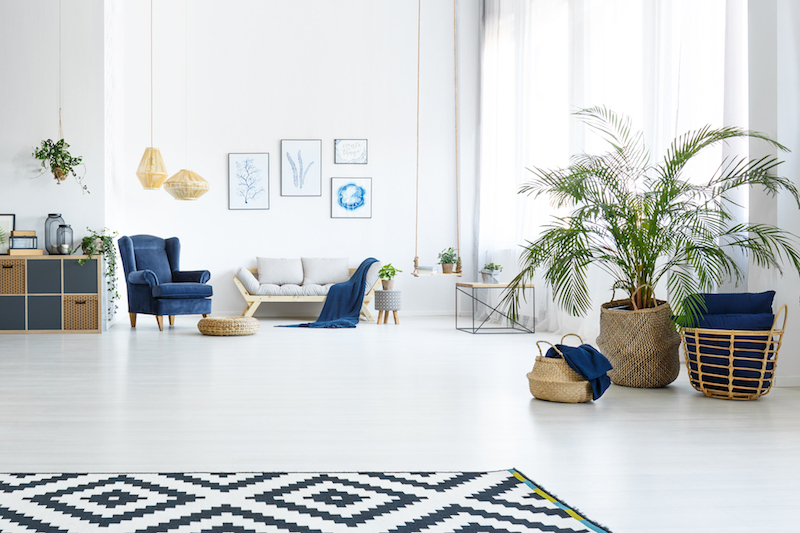 2 How to Decorate Your Small House (Part 3): On a Budget! 3 Which Colour is Best for Bedrooms, According to Vastu? 4 These Are the Best Vastu Colours For Your Kitchen!